Every summer my family would drive nine long hours to visit my father's side of the family. Most of our time we would stay with my grandfather and then ventured out each day to visit whomever was in the area. Usually during our time "back home" my family would arrange a reunion of sorts. This was always my favorite day as all my cousins would arrive. We played hard this day. Dirty, and sweaty from our games. My family only had three girl cousins so the girls always played boy like games. First, we always hiked up my grandpa's hill. Through the woods we would walk loudly trying to scare away black bears that could be sleeping in the summer heat. Later, we'd hike over to grandad's creek to wade amongst the tadpoles and crawdads. Splashing and laughing we always skipped rocks, tried to catch minnows, and listened to lunch's call. My grandfather had an enourmous supper bell attached to his front porch. I always imagined this bell calling my uncles to supper too. Upon hearing the bell we raced to Grandad's kitchen and grabbed a plate. The boys could eat heaping plates of food. And, there was always watermelon. My grandfather always purchased three watermelons. One he cut up, removed the seeds and the adults ate it with a fork. The second watermelon was meant for us, his grandchildren. This watermelon was cut in slices, and we ate it for dessert. We sat on the backporch swinging our legs and spitting. One by one we shot those seedy bullets from our mouths seeing which one went the furthest. Time spent together lasted all day, but we knew that our time would end. A mom or a dad would summons a family of children and our time together would be over. At the end of our time, while the late summer sun was waning we would all fix our gazes upon my grandfather's third watermelon. While we were occupied with one another and our togetherness, he had cut the watermelon in fourths and placed it in the sun. The sweet juiciness drew them in like the reunion drew family together. From wherever they were they swarmed and rested upon my grandad's watermelon. Various colors, symetrical wings and patterns, the butterflies covered the watermelon. Using their straw-like mouths they sucked up the melon's sweet nectar. In the summer's sun they were stunning, and magical. We quietly watched as filled with my grandfather's watermelon they flitted off, like cousins leaving a reunion. Here is the piece of writing that I am thinking about submitting to the Gallery of Writing for the National Day of Writing, October 20th. What will you submit? Recently, I posted that our corporation was experiencing low morale. Today we gathered in our meeting place and heard from our principal the "what if's" that can occur in our coming months and years. Low morale was again the cloud that hung over our school throughout the day. Today, I too started to be swept into that whirlwind that causes people to give up, to pack their bags, and say, "I'm done." But then, at 8:40, the bell rang, and I gathered up my all important papers and walked down the hall to room 134, took my post and hugged 22 faces that greeted me. "Good morning Mrs. Amick!" they all exclaimed. Morale IS low, the things I am faced to do are just for collecting data. Some things will remain the same, I've got to allow my students ample time to choose just right books, ample time to read and practice, ample time to discuss what they are discovering about themselves as readers, and together we will become lifelong lovers of books. On Friday, I got home from school and this package was sitting on my counter! "I wonder what they have sent me now?" I haven't gotten much further but my husband and I discussed at length that that is where public education is, "knowledge factories." What I don't understand is why can't we seem to get this knowledge to the people who are making the choices for us? Why can't we seem to get the research that is showing that we are raising a whole generation of children who can not think for themselves because there is really only one answer to the problems on the test? When will they see that we are just opening up brains and dumping knowledge in whether they are ready or not? When will they discover this and a real change will occur in the world of education? Who do I need to speak to, because I've had enough?!?!?!?! Stenhouse Publishing sends me books to read and review. Currently I am involved with an online discussion group that is discussing Jennifer Allen's new book A Sense of Belonging a book to foster and keep new teachers. While I liked the book I didn't find myself learning a lot, it didn't fit my needs. I asked a colleague who is a coach if she had read Jennifer's first book, Becoming a Literacy Leader and she lent it to me. I am not a coach, I am a first grade teacher, but Jennifer Allen is a coach and both books share her desire to foster teachers as a coach in her building. If you haven't read either of her books I encourage you to a least stop by Stenhouse and read the first chapter and discover this woman's heart for helping teachers. I want to teach in Jennifer's building! I get the feeling that I could go to her to "mull" things over, that I would be encouraged to try new things, that she would help come up with research and materials to support my thinking. I get the feeling that she doesn't just say what is the standard phrase that the state wants her to say, that she has her own beliefs and can support them. She is working hard and loving her work. Her idea of a coach is mainly to coach the teachers, to make available literature that improves their teaching, study groups that encourage conversation, and mentoring texts that teachers can grab and use at a moments notice. Her idea of coaching is what it was meant to be! If you are a coach, or a principal, or even have ideas about what can benefit your school then stop over and get this book! "what do we do about low morale?" "What can I do, right where I am, to improve the morale of my colleagues?" Ultimately, I can do nothing to change the attitudes of those working around me. But, this attitude, this constant talk about what the "corporation" is doing to us is daunting. I love my school, I love the people that I work with, I love the leadership that my principal provides... I am in a good place. The morale is everywhere! I would dare say that if we took a poll across the United States in public sectors that we would find that most educators are desperate to find the solution that helps our public education. This desperation is good. GOOD? This desperation is good because it can be a proponent for change. 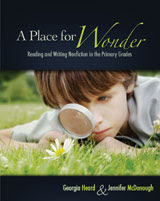 -Knowing what we believe to be true about the instruction of reading. What do we know? How do we know it? What kind of research do we have to support it? The rest we throw out. -What do we know about people that can help us motivate parents, and their children? How can we get them more involved, and how can we show them what to do with their children? Even though we don't have parent teacher conferences because the state took that away from us, we may have to sacrifice our time to help these children and their families. I believe that all children can learn, I believe that they learn by doing, and that working with a teacher in a small group, or individually is how they learn best. These are my beliefs, now I must display that in my teaching.